Our gourmet gift bakery's featured cupcake of the month for October has been Pineapple Soul "Cup"Cakes! We use the Pineapple Ring as a topper to symbolize Eternity in the tradition of the Soul Cake! Here is the recipe for the gluten-free version taken from the Hallowe'en tab of our Seasonal Specialties section from Designer Pastry website. In a small saucepan, over medium-low heat, melt 4 tablespoons butter. Add brown sugar and whisk until blended. Divide mixture evenly among jumbo muffin cups prepared with non-stick cooking spray. Place 1 pineapple ring in each cup. Set aside. Combine flour, baking powder, baking soda and salt in a bowl. In a separate bowl, whisk together sour cream or yogurt, milk, canola oil and vanilla. Set aside. Using a mixer, beat 6 tablespoons of butter and granulated sugar together until pale and fluffy, about 5 minutes. Add egg yolks, one at a time, beating well after each addition. Reduce mixer speed to low and add flour mixture and milk mixture in alternate batches, beginning and ending with flour mixture, until just combined. Divide batter evenly among muffin cups. Bake on center rack of oven for about 25-30 minutes or until a toothpick inserted into center of each muffin cup comes out clean. Cool cupcakes in pan, on a rack, for 15 minutes. Loosen sides of cakes and invert onto a serving dish. This post was written by Victoria, at Designer Pastry, and submitted for publication here at Catholic Cuisine. Thank you Victoria! The tradition of making "Soul Cakes" on All Saints Day or All Souls Day is one which my family has holeheartedly embraced, pun intended. Doughnuts, the modern day version of the old soul cake, are tasty treats on a cool November morning, but they are even tastier when we know the tradition behind the treat. 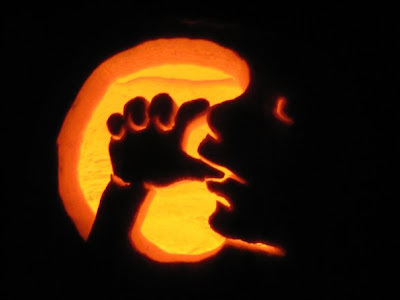 It's likely that the Soul Cake was the precursor to candy on Beggar's Night. 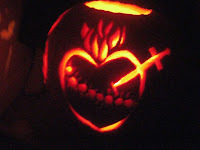 Enjoyed with a cup of hot cider or hot coffee, they are a lovely way to wake up on All Saints Day morning. The dough for this recipe must be made ahead of time, so plan accordingly. And the dough is a little sticky, but just flour your board and flour the top of the dough and you'll be fine. Don't be tempted to work more flour into the dough -- they'll be too dry. I used a doughnut cutter, but if you don't have one, use a biscuit cutter, or glass, and cut the hole with a plastic soda cap. salt, first measure of cinnamon and nutmeg. Make a well in the center and pour in the milk, egg, butter, and vanilla. Pour oil into a two-quart pot until you have a depth of about 3 inches. (I don't use a thermometer; I just wait until it really bubbles up around a bit of dough). On a floured board, roll dough out to 1/2 inch thickness. Use a doughnut cutter to cut out doughnuts. Fry doughnuts in hot oil until golden brown, turning once. Remove from oil to drain on paper towels. Combine the remaining 1/2 teaspoon cinnamon and 1/2 cup sugar in a bowl. turning doughnut and shaking gently to coat. The possibilities are endless! Even though I have shared links to some pictures in last years Hallowed Days: All Saints and All Souls Fair, I thought I would post them here too, and add to the collection! 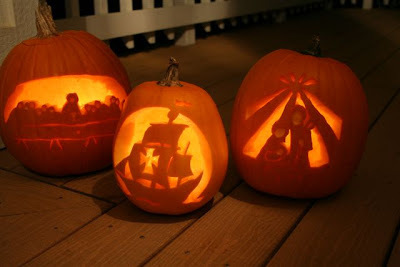 Oh, and Donna at Island in the Grove also shares an excellent idea for converting any of your All Hallows' Eve Jack-O-Lanterns for the feast of All Saints'! 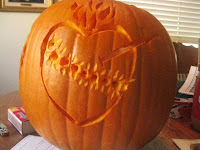 Now I am really anxious to get to the pumpkin patch and find our pumpkins!! 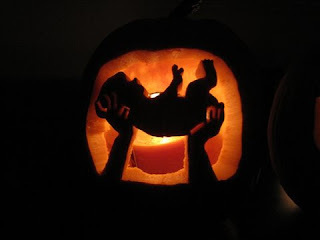 If anyone carves a Saint-O-Lantern this year, or has in the past, please leave a link (or email a picture) since I would love to add your own creations to this post! Here are some of the new additions from this year!! 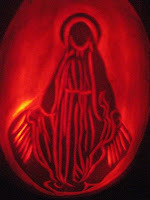 Totus Tuus School carved The Barque of Peter and a Pro-Life Pumpkin. They were very busy at Busy with Blessings! Check out their The Holy Spirit, Christian Symbols, The Church and Christmas Star, The Holy Eucharist, Pro-Life, and Crosses. This treat and story is taken from my website, Designer Pastry, under the Hallowe'en tab of Seasonal Specialties. "Bones of Eliseus" are actually assorted mini sized pretzels piled up to look like a stack of bones with sweet white chocolate melted over top! 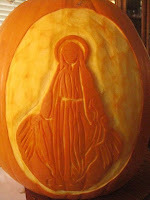 I'm always on the lookout for food saint ideas for All Saint's Day parties, so here's something I came up with for St. Lucy. St. Lucy is populary know as the patroness of eye ailments. This is because among other tortures that she suffered for being a Christian, her eyes were torn out. Legend has it that her sight was returned to her before she died. I thought it would be fun for our All Saint's Day party to make some St. Lucy eyeball cupcakes, and share the idea with all of you! All you do is make your favorite cupcake recipe, and ice them with white icing. Then use blue icing to make a circle on the cupcake, and stick an upside-down chocolate chip in the middle for the pupil. Leave one of them white for display, and cut a slit in the middle of the cupcake so you can insert a St. Lucy holy card. If your holy card isn't laminated, cover it in some packing tape before inserting into the cupcake. St. Lucy is often depicted with a palm branch to symbolize her martyrdom, so I also stuck a palm branch into my cupcake holder for display. I got my palm branch at the Dollar Tree. This post was written by a Catholic mother, at The Masked Mommy, and submitted for publication here at Catholic Cuisine. Thank you for sharing! Today is one of the Fatima days (13th October) but one of special importance as it was the last of the six apparitions and the one where Our Lady delivered her promise ~ a great miracle ~ the miracle of the sun. "From the road, where the vehicles were parked and where hundreds of people who had not dared to brave the mud were congregated, one could see the immense multitude turn toward the sun, which appeared free from clouds and in its zenith. It looked like a plaque of dull silver, and it was possible to look at it without the least discomfort. It might have been an eclipse which was taking place. But at that moment a great shout went up, and one could hear the spectators nearest at hand shouting: "A miracle! A miracle! People then began to ask each other what they had seen. 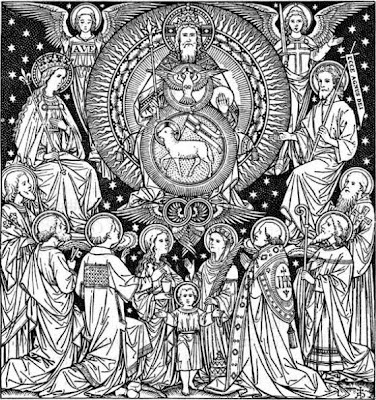 The great majority admitted to having seen the trembling and the dancing of the sun; others affirmed that they saw the face of the Blessed Virgin; others, again, swore that the sun whirled on itself like a giant Catherine wheel and that it lowered itself to the earth as if to burn it in its rays. Some said they saw it change colors successively...."
I hestitated to post this cake because my skills are not crash hot but I then I thought at least the idea is conveyed, I am sure that other ladies could do great justice with this idea! "others, again, swore that the sun whirled on itself like a giant Catherine wheel and that it lowered itself to the earth as if to burn it in its rays. Some said they saw it change colors successively." I used a Marble Cake recipe. Preheat oven to 180°C. (356 F or moderate oven) Brush a round 20cm (7.87 inches) (base measurement) cake pan with melted butter to grease. Line the base and side with non-stick baking paper. Use an electric beater to beat together the butter, sugar and vanilla in a bowl until pale and creamy. Add the eggs, one at a time, beating well after each addition until combined. Add half the flour to the butter mixture and stir until just combined. Add the sour cream and remaining flour, in batches, and stir until just combined. Divide the batter among 3 bowls. Add a few drops of pink food colouring to 1 portion and stir to combine. 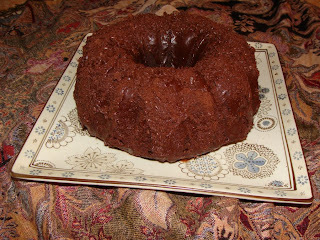 Combine the cocoa powder and milk in a small bowl and add to another portion of batter. Stir to combine. Place alternate spoonfuls of the 3 batters into the prepared pan. 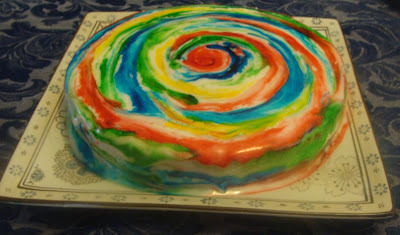 Use a spoon to swirl the colours together to create a marble effect. Use the back of a spoon to smooth the surface. Bake for 1 hour or until a skewer inserted into the centre comes out clean. Set aside for 5 minutes to cool before turning out onto a wire rack to cool completely. 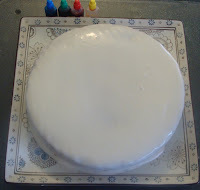 To ice the cake I made up a simple mixture using icing sugar and milk. 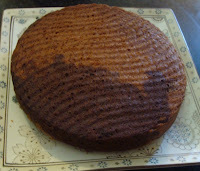 I covered the cake in this uncoloured icing, see the photo above. Then I took the four icing colours and placed a drop and with a clean finger, spread it around in a circle, starting from the center and working out to the edge and down the sides. Unfortunately I was almost out of yellow, I would have liked to have used more of that colour for a nice balance. 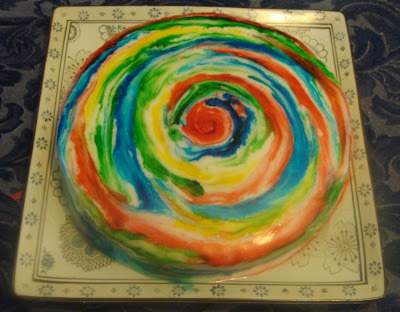 This would be a lovely cake to eat while watching the movie, The Miracle of Our Lady of Fatima the children also had alot of fun making the spinning, colourful sun. 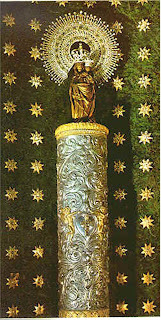 Today is the feast of Our Lady of the Pillar, a beautiful, ancient apparition where Our Lady did not decend from heaven but bilocated to St James in Spain before her own death. Kathyrn from UK Bookworm has a lovely blog posting with more details of this incredible story. Here is the wooden statue of Our Lady and the Child Jesus sitting up the jasper pillar (now covered in precious metal) that Our Lady gave to St James in Spain. Preheat oven to 180°C. (356 F) (moderate oven) Brush a 24 x 30cm (base measurement) Swiss roll pan with melted butter and line with baking paper. Use an electric beater to beat egg yolks, sugar and vanilla in a bowl until a ribbon trail forms when the beater is lifted. Use clean beaters to beat egg whites in a clean, dry bowl until soft peaks form. Fold into yolk mixture. Sift over flour and use a metal spoon to gently fold until combined. Pour into prepared pan. Bake in oven for 15 minutes or until a skewer inserted into the centre comes out clean. Remove from oven. Cover with baking paper, then a damp tea towel. Set aside for 30 minutes to cool. Dust a piece of baking paper with icing sugar. Remove tea towel and paper from sponge and turn onto icing sugar. Spread with preserve. Starting with the short edge and using the baking paper as a guide, firmly roll up sponge. Wrap in baking paper and place, seam-side down, on a baking tray. Set aside for 30 minutes to set. Dust with icing sugar. I made up some icing using icing sugar and milk, added a few drops of yellow colouring and piped the scrolling pattern onto the cake. You can keep this easy if you like and buy a swiss roll, if time is pressing! 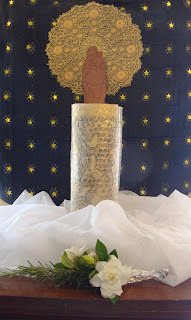 Here is our Our Lady of the Pillar craft, if you would like to see how we made this, click here. 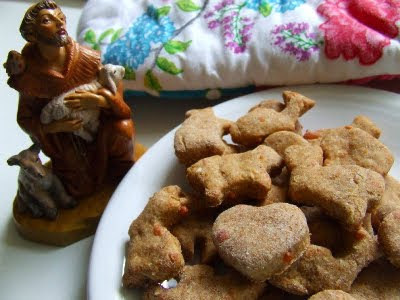 We made some special treats for our furry friends today in honor of St. Francis of Assisi, patron of animals. Preheat oven to 350 degrees. Combine tuna, egg white and water. Add cornmeal and flour and blend to form a dough. Knead into a ball and roll to 1/4 inch thick. Cut into one-inch sized pieces. Bake at 350 F for 20 minutes. Yesterday morning I went to a garage sale. 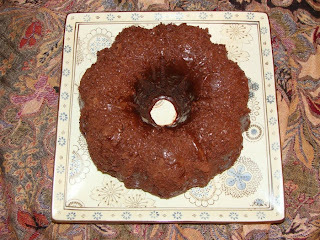 I was very fortunate to pick up a 9cup Nordicware Bundt pan for $1! I always like those moments, because often there is something about the timing of finding these treasures. 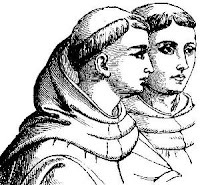 If you were to play a Catholic version of a word association game and someone was to say to you, "Tonsure!" 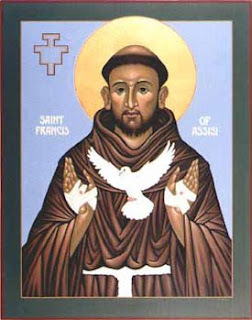 would you say, "St Francis!!" ? I think I would! 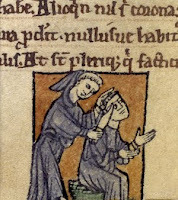 Out of all the saints that had a tonsure I think St Francis would be one of the most famous and most memorable. "And Paul after this tarried there yet a good while, and then took his leave of the brethren, and sailed thence into Syria, and with him Priscilla and Aquila; having shorn his head in Cen'chre-ae: for he had a vow." 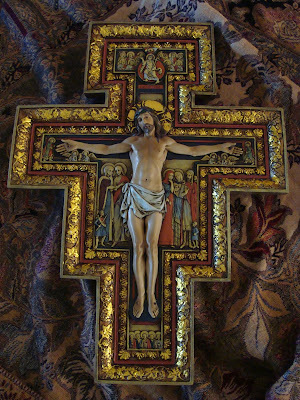 Here is a close up of our beautiful San Damiano Crucifix, that we bought for our ds 14, who took St Francis as his confirmation saint a few years back. 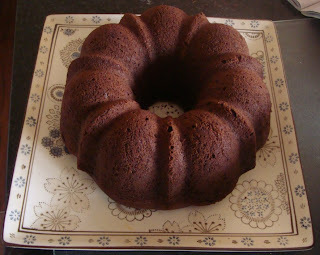 Here is my very simple recipe for the Tonsure Cake, use any sort of ring cake mould you may have. 1/ Heat the oven to moderate. Grease your ring cake. 2/ Beat butter, essence and sugar in small bowl until light and fluffy; add eggs, one at a time, beat until combined. 3/ Stir in milk and sifted four and cocoa; spoon mixture into prepared pan. 4/ Bake cake in moderate oven for about an hour (I cooked it for about 50mins) Stand cake in pan 5 minutes then turn onto wire rack to cool. 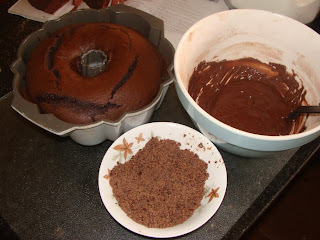 Pour icing mixture over the cake and then lastly I grated some dark chocolate and covered the warm icing mixture in grated chocolate to give the texture of short hair. All done and ready to eat tonight with the family! 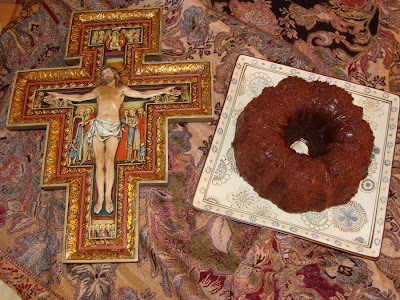 This can be a quick and easy cake to use for any of the saints who had tonsures...ones that come to mind are St Anthony and St Thomas Aquinas. 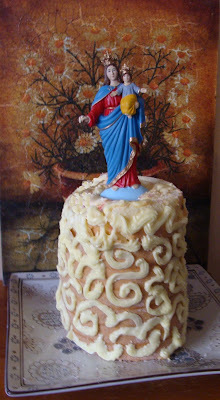 There are probably many lesser known saints that had tonsures, so this cake may be a great way to remember them in a meal on their feast day if you have a particular devotion. Happy Feast Day! 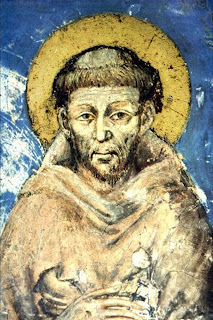 St Francis of Assisi, pray for us! Oh....I had to come back and add this cute photo! 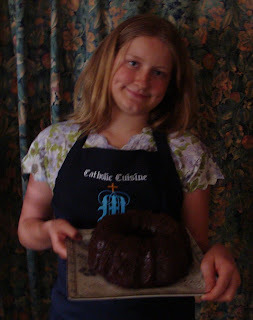 My dear daughter who helped me make this cake, wearing a Catholic Cuisine apron!